Barcelona progressed after this second leg victory, in an almost carbon copy of the first leg as valiant Arsenal created enough chances to make a fist of it, but ultimately the gulf in class up front swung it for the reigning European Champions. What a difference in display from the Gunners though – a complete departure from recent matches. As expected, there was change afoot in the starting lineup. Laurent Koscielny went straight into the team at the expense of Per Mertesacker and Nacho Monreal made his 100th start for the Gunners. Mathieu Flamini perhaps was the name which raised the most eyebrows, coming in for Coquelin, and Alex Iwobi made his first Champions League start – wide on the right. Danny Welbeck – so impressive since coming back from long term injury, also started, with Theo and Giroud on the bench. The home team started neatly and possession was theirs to do as they wish. A few decent touches and vital interceptions from Gunners defenders stymied the flow and Arsenal started to grow in stature. Danny Welbeck got in the way of his own shot and deflected it out of play but as tradition states – the fifth official is basically a scarecrow and doesn’t get involved in any decisions – so Arsenal were gifted a corner kick! Another tradition is that Arsenal never beat the first man at the front post and this also came to be. Mesut Ozil redeemed himself though after the poor delivery, and curled a shot just wide. Mohamed Elneny also flashed a shot just off target and just as in the first leg – Arsenal were getting the premium chances. They pushed up high and the offside trap was working to full effect. Then, disaster struck. On the eighteenth minute, David Ospina produced a fantastic save from a Messi effort, and Arsenal attempted to play out from the back. Unfortunately though, Gabriel gave the ball away and Suarez capitalised to slide a simple pass through to Neymar who was one on one with Ospina, and this time there was no heroics from the Columbian. 1-0 down inside twenty minutes and 3-0 down on aggregate. The chase was done, but Arsenal could still boost flagging confidences with a decent result. What was imperative is that a flogging could not happen. It would run through into Saturday’s game with Everton and disaster would turn into Armageddon. Our side thrive on confidence, it is their sustenance, and without it they are a shadow of a side, so they would have to put in a hell of a shift to get a positive result. The game continued and to our credit, we continued in the same vein, pressing hard when they entered our attacking third, and with the ball, we looked lively. Quite why this has been bereft from our last few league games is beyond me, but we were moving and giving teammates options. On 31 minutes, Flamini received his customary yellow card for a foul on Andres Iniesta – that is certainly one way to stop him. With all the stigma Flamini has attached to him, he did in fact put himself about and got stuck in, but as ever, his positional discipline was errant. Barca were starting to turn the screw, and the dizzying passing formations were causing most of our players headaches, but a swift breakaway – not the first from the Gunners in the first half – led to Alex Iwobi ahead of Javier Mascherano in the box. On video replays, it showed the Argentine clipping the heels of the young Nigerian, but appeals were waved away. It was a penalty, but much like the last six weeks or so, luck has been a stranger to Arsenal. 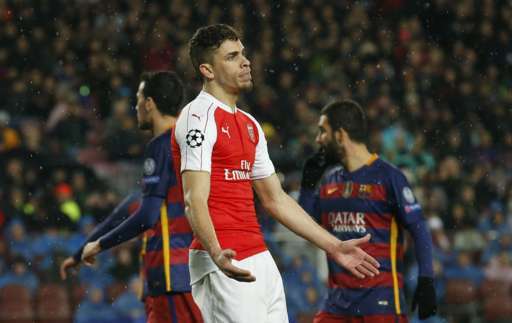 Gabriel, as furious as ever, was booked for his overzealous appeals to the match official. Arsenal had a spate of half chances from there, as Iwobi, Elneny and Sanchez all had opportunities to shoot blocked or see the ball go agonisingly wide. These occasions see the little differences make the gap all the wider and for all the pleasing tactics, disciplined play and chances created, we were still a goal down. The more prevalent thought was – where has this Arsenal been? Then, on the forty-fourth minute, Mathieu Flamini was holding his hamstring, and Francis Coquelin came on at his expense to make his 100th appearance in an Arsenal jersey, and half time soon came. Coquelin has not had the best time of late, his usual intensity and prowling style has been replaced with a softer- diet version of his full-fat game. Arsene must have been hoping this was the game for the return of his hatchet man, but this also applies to Alexis Sanchez and half of the squad, as poor form has stalked Arsenal in 2016. The first half at the Camp Nou though, had seen a thorough and vibrant performance. All that was missing was the scoreline to match the application. Arsenal started the second half full of presence, and Mohamed Elneny pressed Ter Stegen into a skewed clearance which Alexis Sanchez capitalised on. He passed the ball to the Egyptian who was running onto the ball and his side foot finish from just inside the box arced high into the net and Arsenal had got the goal their play had deserved – especially in the first leg. It was 3-1 on aggregate, the chance for progression had gone, but Arsenal’s blood was pumping, they had the bit between their teeth and they could smell a chance to send a message to all and sundry – they weren’t to be written off just yet. Whilst their European campaign was more or less over, they could still impress in the Premier League and a fantastic performance in the Camp Nou could be the medicine the Gunners needed to revive their flagging fortunes. With an opponent as dangerous as Barcelona though, minds must be sharp and there was no time for celebration. Messi drew another sharp save from Ospina, but again Arsenal went on the counter attack, and only an astute last-ditch tackle from Mascherano stopped Welbeck from testing Ter Stegen. Arsenal were pumped for this. Like a cornered animal though, it was Barca who scored next. 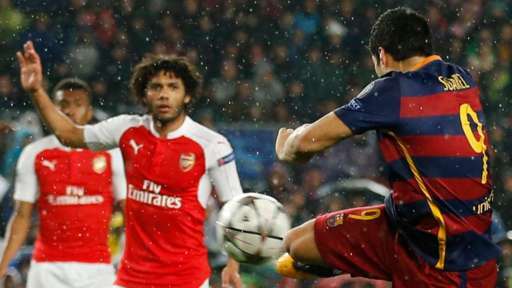 Despite Arsenal looking the far likelier to add to the scoreline next, Luis Suarez pulled something out of his magic bag. A cross was missed by everyone and Hector Bellerin, who was guarding the far post area, slipped. The buck-toothed Uruguayan carnivore then volleyed the ball with the outside of his foot and it speared into the far top corner. A sumptuous finish, and a killer of hope. It really was game over, and responsibility must fall on the raft of missed chances we had over both games. We really could have done something special, with all the opportunities we had made. It wasn’t the smashing that all had predicted, but the difference between the cream of Europe was the clinical nature of the Catalans. With about twenty or so minutes to play, Danny Welbeck and Alex Iwobi were replaced by Olivier Giroud and Theo Walcott. Both men coming off had run themselves into the ground and Iwobi in particular, had shown that he is more than worthy of his place in the side. Always efficient in possession, rapid on the ball and an intuitive range of passing, the young man who has been at Arsenal since he was twelve years old really looks to be shaping up to be a top level player. Danny Welbeck could have fared a little better in front of goal but the fact remains that he is the striker at Arsenal in the most form. He will be so important on Saturday at Goodison Park and Arsene Wenger made the right call to rest the England man. Mesut Ozil hadn’t made the impact he would’ve wished, save for the odd flick and pass, but he retains the ability to turn a game on its head with a single pass. Whilst playing ninety minutes three days before the Everton game may hamper his effectiveness, a man of his talent must be juiced to the max! Ozil was off the boil, but the third goal was not born from his failings. Another case of lost possession saw a ball through to Messi, who was all on his own to face Ospina. A wonderfully cute finish saw the world’s greatest player give his side their third goal and the second leg a gloss they did not deserve. They warranted being through to the next stage, but a 3-1 scoreline for this game was not a fair balance on the whole game, which the Gunners had given just as good as they had got. The game petered out a little in the last fifteen minutes. Half chances for both, a couple of bookings, but the result was set in stone. Arsenal had redeemed themselves after some ineptitude of late and if this level of performance was matched on Saturday, three valuable points will no doubt be earned. So, another last 16 exit, but another tie in which they can hold their head up high. At some point, this glass ceiling will have to be smashed, but for this season, all eyes fix squarely on the Premier League, where more work must be put in to avert catastrophe.